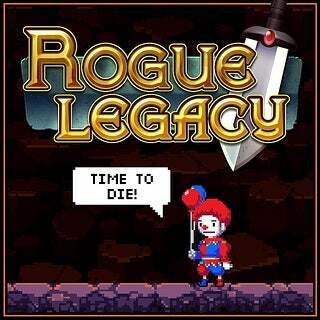 Rogue Legacy is an interesting basket. On one hand, you have this incredibly difficult title that is a love child of Dark Souls and Ghosts n' Goblins that will bring you to the point of a stroke. The other hand, it is a beautifully melded title that takes what we love most about RPG's, and adds its own spice of humor to it. Needless to say, I love/hate/adore/despise this title. After its current release last week on the Playstation Store I have been playing it almost non stop, and plowing through my family tree like a bag of potato chips. My most recent spawn, which is a Barbarian Queen with A.D.H.D and I.B.S (Yes, those are real traits in the game) is the 100th or 1,000th iteration of my ancestor who must rid the castle of... Oh poop, I died. With each child you control, you carry forward all of the loot and armor your parent had. Say for instance, my Lich had $4,000 gold. Her child will now have that money to use towards armor, runes, or building up the families skill tree. The traits range from unlocking new people in your town (Smithy, Enchantress, and the Architect), boosting you traits, and even unlocking new classes. The game contains some pretty unique classes, and each one has advance classes you can unlock from there. The Knight becomes a Paladin, which has the ability to use a shield. The Barbarian turns into a King/Queen, and has the ability to do a knock back Shout a la Skyrim. Mage turns into an Archmage, which gains the ability to scroll through three separate spells. The Knave turns into an Assassin, in which you can go into mist form and avoid attacks. The Shinobi, Lich, Miner, and Spellthief require further advancement in your skill tree to unlock. The traits in the game are pure genius, and at times can be annoying. The worst one is Vertigo, which turns the game upside down and proves to be completely annoying. I end up sacrificing those children if I accidentally select them. Others, like O.C.D. and Clumsy, can prove to be beneficial. O.C.D. regains MP for every item you destroy, and being Clumsy means your character destroys items just by walking into them. Others, like Hypochondria and The One, are just pure enjoyment. Choosing The One lets you see the true castle, which is similar to Tron, and being a Hypochondriac shows exaggerated damage (2565!) over the characters head. During your journey(s) through the castle, you come across a multitude of treasure chests. Some of them carry masses of gold, while others carry blueprints for new armor and weapons. If you do come across new blue prints, the Smithy can start crafting them. New armor and weapons are incredibly helpful, which I am sure you knew. Some of the pieces have certain traits, like gaining health from each kill or increasing you crit%. The humble beginnings of a long, grueling grind fest. The Enchantress gives you the ability to equip runes to your armor and weapons. Runes, which can be acquired after completing certain trials, give your character added traits. You can use certain runes to double jump, dash, increase the amount of gold acquired, and even increase the difficulty of enemies (if you are completely insane). The Architect has an interesting role in the game, and was one that I relied on a lot in the beginning. His sole purpose is to lock down the layout of the castle, so you can continue your journey without needing to explore the whole damn thing over again. He was only useful for me when I am fighting a boss, and didn't feel like running aimlessly through the castle all over again. His only downside is cutting the amount of gold you get from enemies and chests, dropping the amount by 30%. A small price to pay when you are incredibly frustrated, and on the verge of pulling your hair out. The game has four main areas; The Castle, The Forest, The Tower, and The Land of Darkness. While at the beginning it s unclear which area you need to go next, I have found through trial and error (as well as journal entries) that this pattern is the best and "easiest" way to go. Each of these areas also have boss battles a in them, and require you to kill them before moving on to the final boss. The first boss you come across, Khidr, is a giant eyeball that fires a multitude of projectiles at you. The boss battle, which requires a lot of jumping and dodging, reminded me a lot of boss battles from vertical shooters, in which he is a stationary enemy and you have to move around him. I died roughly 5-7 times trying to fight him, which is about a fraction of the deaths I suffered just to get there. At the time of this review, I am currently at the fourth boss and trying to destroy him. I have died roughly 700+ times, and still find the damn game a blast. My ending impression of this game is nothing but positive. I recomend it fully for those who love games like Dark Souls, Castlevania, and Ghosts n' Goblins. The game is rage inducing, and incredibly rewarding at the same time, and is one that is definitely worth the $16 I paid for it. I played mostly on the Vita (which works incredibly well), and some on PS4 (which was also really smooth).